Welcome to the Artwork of Michael Krasowitz. Michael has been working with two dimensional media for most of his life, starting as a photographer, and evolving into a painter/printmaker today. 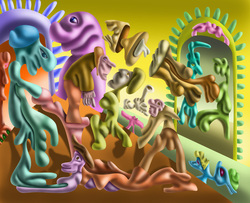 This website will show many genres of his work and study. His basic working principle is that of discovery......how the creative process can unveil aspects of his consciousness beyond normal perception. The process is simple, create as you go.......start with a shape and let the process of creativity bring out things that conscious intent could never manifest.